Mount Agung on the Indonesian holiday island of Bali erupted late on Monday, hurling lava and ash kilometres into the air and prompting panicked residents to flee their homes. 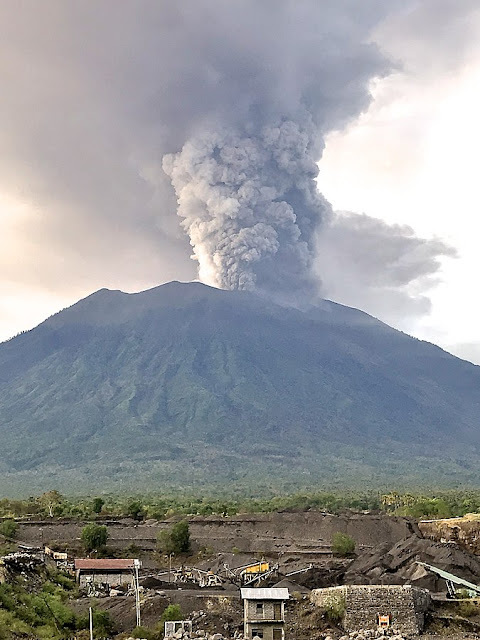 Mount Agung in northeast Bali has been rumbling since late last year and on Friday there was a temporary closure of the island’s international airport, disrupting flights and stranding thousands of travellers. According to Reuters, Indonesia’s national disaster mitigation agency said residents heard a loud explosion and saw flaming volcanic rocks thrown at least 2 km (1.2 miles) out of the crater. The eruption lasted for about seven minutes and photographs posted by the agency showed glowing lava streaming from the crater, setting fire to vegetation. “Residents have started evacuating voluntarily,” said Sutopo Nugroho, a spokesman for the agency, adding the airport remained operational and there was no change in the volcano’s alert status. The last time Agung staged a major eruption was in 1963 when more than 1,000 people died and several villages on its slopes were razed.